Margaret Adeline Loerwald, longtime Hereford resident, went home to be with her Lord Thursday, June7th, 2018 at the age of 100. A Rosary is scheduled for Friday, June 8th at 6:30 pm at St. Anthony’s Catholic Church. The Mass of Christian Burial will be held Saturday, June 9th at 10:00 am at St. Anthony Catholic Church. Fr. Anthony Neusch will be the celebrant. Mrs. Loerwald was born on July 28,1917 to Clem and Angela (Klement) Schumacher in Muenster, Texas. She came to Hereford in February of 1927 and graduated from Hereford High School in 1936. She married the love of her life, Edmund Frank Loerwald, on November 9, 1936 at St. Anthony’s Church of Hereford, and the couple settled in to raise their family. She was a homemaker and a devoted wife and mother to her husband and children. 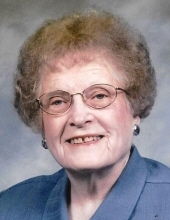 Adeline was active in the community and served on the Hereford Day Care Board and was an active member of St. Anthony’s Church and the Diocese of Amarillo. She served as the church bookkeeper and secretary for many years, retiring in 1984. Mrs. Loerwald is preceded in death by her parents, her beloved husband Edmund, and by her brothers Ernie and Andrew Schumacher and sister Marie Loerwald, and two sons-in-law: Frank Brorman and Dale Smith. Those left to cherish her memory are her children: Dolores Brorman of Vega, Texas, Susie Dolle and husband Don of Canyon, Texas, Pat Simnacher and husband Al of Hereford, Texas, Cindy Feery and husband Pat of Albuquerque, New Mexico, Claudia Smith of Hereford, Texas, Paul Loerwald of Fort Worth, Texas, and Dave Loerwald and wife Lori of Carrollton, Texas. In addition, she is survived by her two sisters-in-law Oleda Schumacher and Billie Faye Schumacher. Adeline leaves behind 29 grandchildren, 61 great-grandchildren, 14 great great-grandchildren, many nieces and nephews, and a host of friends. The family requests that memorial donations be made to St. Anthony’s School Endowment Fund. "Email Address" would like to share the life celebration of Margaret Adeline Loerwald. Click on the "link" to go to share a favorite memory or leave a condolence message for the family.